I’ve driven most roads in Scotland, especially the scenic ones, and enjoyed almost every mile of all of them. I don’t think there is such a thing as a boring road in Scotland, especially when you’re outside urban areas. And no matter how beautiful some of these roads are, there are always a few that are just a tad more stunning, roads that stick in your mind as being “very special”. One of them is the Road to the Isles and the other one is the drive through Glen Shiel. Both offer an unforgettable driving experience amidst some of the most beautiful scenery Scotland has to offer. 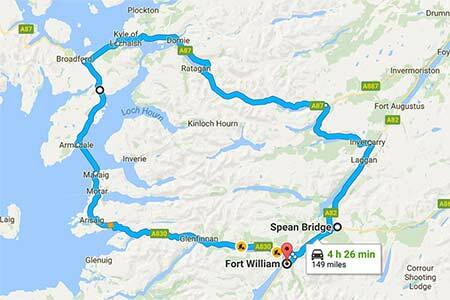 Now what better can you do than to combine these two routes and turn them into one amazing Highlands driving Route? These two routes combined offer an absolutely stunning driving experience. You’ll drive the legendary Road to the Isles, pass Glenfinnan Monument and Viaduct, see the stunning west coast and the villages of Arisaig and Morar, board a ferry at Mallaig to Armadale on the Isle of Skye and head back over the Skye Bridge via Kyle of Lochalsh and Eilean Donan Castle through one of Scotland’s most beautiful glens, Glen Shiel, and at the end you can pay tribute to our soldiers at the commando memorial at Spean Bridge with views of Ben Nevis. I want to name this route the Highlands 140. Want to know more? Here we go! The Highlands 140 driving route is, as the name says, 140 miles long and the total driving time is around 5 to 9 hours which includes the 40 minute ferry crossing from Mallaig to Armadale on Skye. Total driving time depends of course on the amount of stops etc. Without any stops it’s around 5 hours. The start and finish can be everywhere along the route but I choose Spean Bridge as departure place. Spean Bridge is a lovely wee village with shops, cafe’s, a good parking area and a lovely train station. 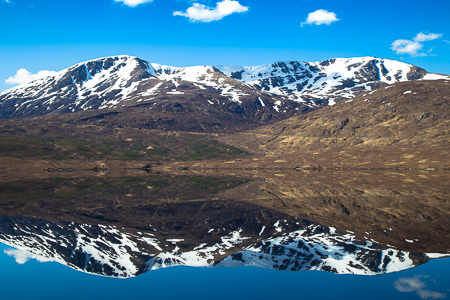 From Spean Bridge head south over the A82 to Fort William and from there follow the legendary Road to the Isles, the A830, which is a one hour drive from Fort William to reach Mallaig. Halfway you can stop and visit the famous Glenfinnan viaduct and memorial while admiring the stunning views over Loch Shiel. When you reach Arisaig it’s highly recommended not to drive the new road from Arisaig but to follow the old road along the coast. Here you’ll pass famous Ben’s Beach, from the movie Local Hero, as well as the Silver Sands of Morar. The views towards the Small Isles and the Isle of Skye are spectacular. The old road will end up on the new road in Morar where you’ll follow it to Mallaig. When you reach Armadale on the Isle of Sky you’ll have a 30 minute drive ahead of you before you reach the Skye bridge and Kyle of Lochalsh on the mainland. Kyle of Lochalsh is a typical place to stop for a drink and a stroll along Loch Alsh while admiring the views of the Skye Bridge before starting on the last leg of the Highlands 140, the stunning drive through Glen Shiel, one of Scotland’s most beautiful glens. Instead of taking the A851 for its full length along the Sleat peninsula on Skye, a more scenic route takes the minor road west at Ostaig (3km from Armadale) to Tarskavaig and Tokavaig before turning east again at Ord to eventually rejoin the A851 at Loch nan Dubhrachan. Between Tarskavaig and Ord the views across the sea to the Cuillin ridge are quite unforgettable and well worth the additional time taken. As you follow the shore of Loch Alsh from Kyle of Lochalsh you’ll reach the immensely popular Eilean Donan castle, probably the most photographed castle in Scotland, and perhaps the world. There’s a large parking area on the left side of the road in case you want to visit. The views from the castle over Loch Alsh and Loch Duich are quite impressive. In this last leg of the driving route it’s going to be hard to both keep your eyes on the road and to admire the spectacular Highland landscape, especially the stretch from Shiel Bridge to the Cluanie Inn, the road along Loch Cluanie all the way to Glengarry and Invergarry Castle on the shores of Loch Och. However, there are a few places where you can stop, park your car and admire the breathtaking scenery and take some photo’s. 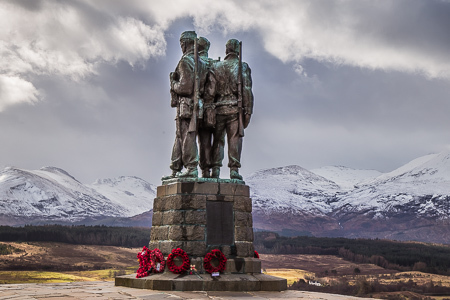 From here on you’ll need to get back on the A82 south and after a beautiful 16 mile drive, keeping Loch Lochy on your right, you’ll reach a famous landmark, the Commando Memorial, one mile outside Spean Bridge. Make sure to stop here and admire the amazing views over Loch Lochy and towards Ben Nevis, the highest mountain in the UK. You’ve now reached the end of the Highlands 140 Driving Route, in my opinion one of the most beautiful one day driving routes you can make in Scotland. I hope you feel the same way, please leave a comment below if you have more interesting bits about this tour or if you’re planning on doing the tour yourself. 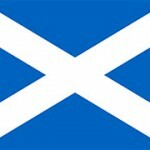 I lived on the Isle of Skye and have driven through all the areas in the highlands many times. You cannot help but fall in love with them . I have to agree, your first experience of travelling towards the Kyle of Lochalsh from Spean Bridge, is pretty special, and turning the corner into Kintail. is the stuff of dreams, with Skye on the horizon. If your blessed with fine clear weather, the views are amongst the finest in Western Scotland. I plan to return in April 2019, and bring my own transport, because on my first visit, i was on a coaching holiday. The views and parking places are many, so its best to bring your own transport, so that you can drive this route at a leisurely pace. Having travelled this route many times I totally agree with most of the article but suggest a small amendment to the route. Instead of taking the A851 for its full length along the Sleat peninsula on Skye, a more scenic route takes the minor road west at Ostaig (3km from Armadale) to Tarskavaig and Tokavaig before turning east again at Ord to eventually rejoin the A851 at Loch nan Dubhrachan. Between Tarskavaig and Ord the views across the sea to the Cuillin ridge are quite unforgettable and well worth the additional time taken.